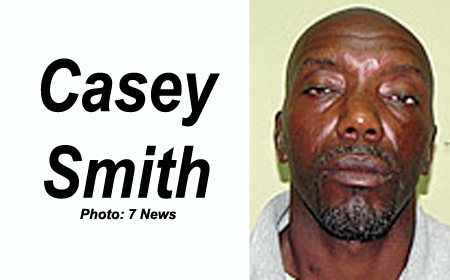 BELMOPAN–Casey Fitzgerald Smith, 35, of Bishop Street, Belize City, has been sentenced to three years in prison after being found guilty of drug trafficking. Smith was additionally fined $10,000 and if he defaults on payment, he will spend an additional 3 years in jail. Smith was sentenced to an additional 5 years in jail for keeping an unlicensed gun and another 5 years for keeping eight 9mm live rounds without a gun license. He was taken to the Belmopan Magistrate’s Court on Friday for the drug trafficking and gun and ammunition possession charges, and he pleaded guilty to the offenses. The sentences were ordered to be served concurrently, so Smith will spend only 5 years in jail, but if he fails to pay the $10,000 fine, he will spend an additional 3 years on top of the 5 years that he has to spend for the weed, gun and ammo. The incident that led to Smith’s arrest occurred at about 12:30 Friday morning on the Franks Eddy Village Road. Police said that they were conducting an anti-drug operation and stopped a car that was travelling from Franks Eddy to Belize City. Police said that during their search they found a 9mm Ruger pistol loaded with eight live rounds, and police also found 95 pounds of weed in two crocus sacks in the car. Travelling in the car with Smith were two women, Jenny Silva and Yolanda Patt, both of Church Street, Benque Viejo Town. They were all charged with drug trafficking and keeping an unlicensed firearm and ammunition. Smith, however, pleaded guilty to the offenses in court, and the charges against the two women were withdrawn.